Bu çalışmada sanayi üretim düzeyinde etkili olan geleneksel makroekonomik faktörlerden farklı olarak üreticilere ve tüketicilere yönelik güven endeksleri aracılığıyla ekonomiye duyulan güvenin üretim seviyesi üzerindeki etkisi araştırılmıştır. Çalışmada kullanılan veri seti Türkiye için aylık olarak 2007:01-2017:12 dönemini kapsamaktadır. İncelenen dönemin 2008 krizini de içinde barındıran bir dönem olması sebebiyle kriz etkisinin görüldüğü 2007-2010 dönemi ile kriz sonrası görece istikrarlı dönem olarak kabul edebileceğimiz 2010-2017 dönemleri ayrı ayrı incelenmiştir. İncelenen dönemde verilerin hepsinde mevsimsellik ve trend bileşenlerinin varlığı saptanmış ve arındırılmıştır. Birim kök testleri vasıtasıyla tüm değişkenlerin aynı dereceden durağan olduğu saptandıktan sonra elde edilen VEC modelleri neticesinde tüketici güven endeksinin sanayi üretimi üzerinde belirli düzeyde etkili olduğu, reel kesim güven endeksinin etkisinin tüketici güven endeksine kıyasla daha sınırlı kaldığı görülmektedir. Her iki analiz dönemde de kriz dönemlerinde güven endekslerinin etkilerinin daha belirgin olarak hissedildiği gözlemlenmiştir. This study aims to analzye the effect of confidence on industrial production by using consumer confidence and real sector confidence indices. The data set covers Turkish monthly data of 2007:01-2017:12. Since the time period covers the 2008 crisis, the periods are analyzed seperately; the crises period of 2007-2010 and the rather stable period of 2010-2017. The data is analyzed for seasonality and trend components and adjusted for the analzed period. The stationarity of all the variables are tested by unit root tests and the VEC models results reveal that the effect of consumer confidence index on the industrial production is observed significantly however the effect of real sector confidence index on industrial prıoduction index is less significant when compared to the consumer confidence index. In both analysis periods, the effect of confidence indices reveals a more significant effect on production during the crisis periods. Acemoglu, D. ve Scott, A. (1994). Consumer Confidence and Rational Expectations: Are Agents’ Beliefs Consistent with the Theory? Economic Journal, 104(422), 1-19. Adams, F. G. ve Klein, L. R. (1972). Anticipatory Variables in Macroeconomic Models, in Human Behavior in Economic Affairs: Essays in Honour of George KAtona. B. Strümpel, J. N. Morgan and E. Zahn, eds. New York, Elsevier, 299-320. Arısoy, İ. (2012). Türkiye Ekonomisinde İktisadi Güven Endeksleri ve Seçilmiş Makro Değişkenler Arasındaki İlişkilerin VAR Analizi. Maliye Dergisi, 162, 304-315. Carrol, C. D., Fuhrer, J. C. ve Wilcox D. W. (1994). Does Consumer Sentiment Forecast House-holds’Spending? If So Why? American Economic Review, 84(5), 1397-408. Desroches, B. ve Gosselin, M. A. (2002). The Usefulness of Consumer Confidence Indexes in the United States, Bank of Canada Working Paper, 2002-22. Dickey A. D. ve Fuller, A. W. (1979). Distribution of the Estimators for Autoregressive Time Series with a Unit Root, Journal of the American Statistical Association, 74, 427-31. Engle, R. ve Granger, C. (1987). Co-integration and Error Correction: Representation, Estimation, and Testing, Econometrica, 55(2), 251-76. Fair, R. C., (1971). Consumer Sentiment, Stock Market, and Consumption Functions., Econometric Research Program Research Memorandum No. 119, Princeton University. Fuhrer, J. C. (1988). On the Information Content of Consumer Survey Expectations. Review of Economics and Statistics, 70(1), 140-44. Fuhrer J. C. (1993). What Role Does Consumer Sentiment Play in the U.S. Macroeconomy? New England Economic Review, Jan, 32-44. Golinelli, R., & Parigi, G. (2004). Consumer Sentiment and Economic Activity: A Cross Country Comparison. Journal of Business Cycle Measurement and Analysis, 1(2), 147-172. Garner, C. A. (1991). Forecasting Consumer Spending: Should Economists Pay Attention to the Consumer Confidence Surveys? Economic Review, Federal Reserve Bank of Kansas City, May-June, 57-71. Gelper, S., Lemmens, A., ve Croux, C. (2007). Consumer Sentiment and Consumer Spending: De-composing the Granger Causal Relationship in the Time Domain. Applied Economics, 39(1), 1–11. Güneş, H., ve Çelik, S. (2010). Differences in Expectation Formation of Consumers in Emerging and Industrialized Markets. In 69th International Atlantic Economic Society Conference, Prague. Hymans, S. H. (1970). Consumer Durables Spending: Explanation and Prediction. Brookings Papers on Economic Activity, 2, 173-199. Johansen, S. (1988). 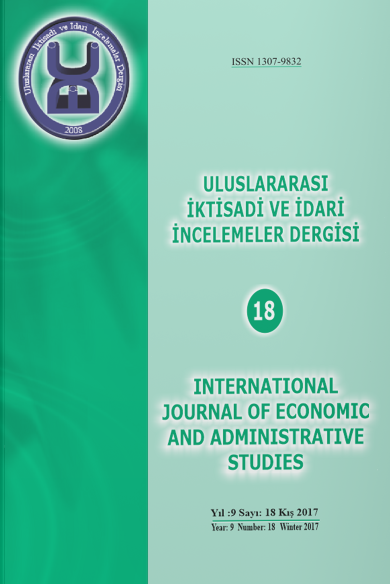 Statistical Analysis of Cointegration Vectors, Journal of Economic Dynamics and Control, S.12, 231-54. Johansen, S., (1991). Estimation and Hypothesis Testing of Cointegration Vectors in Gaussian Vector Autoregressive Models, Econometrica, Vol. 59, No. 6, pp. 1551–1580. Johansen, S., (1995). Likelihood-Based Inference in Cointegrated Vector Autoregressive Models (New York: Oxford University Press). Johansen, S. and Juselius, K., (1990). Maximum Likelihood Estimation and Inference on Cointegra-tion–with Applications to the Demand for Money, Oxford Bulletin of Economics and Sta-tistics, Vol. 52, No. 2, pp. 169–210. Katona, G. (1951). Psychological Analysis of Economic Behavior. New York: McGraw-Hill. Katona, G. (1975). Psychological Economics. Oxford, England: Elsevier. Katona, G. (1978). Psychology and Economics: Discussion, American Economic Review, 68(2), 75-76. Kumar, V., Leone, R. P. ve Gaskins, J. N. (1995). Aggregate and Disaggregate Sector Forecasting Using Consumer Confidence Measures, International Journal of Forecasting, 11, 361-77. Lovell, M. C. (1975). Why was the Consumer Feelin So Bad? Brookings Papers on Economic Activity 2, 473-479. Matsusaka, J. G. ve Sbordone, A. M. (1995). Consumer Confidence and Economic Fluctuations, Economic Inquiry 33(2), 296-318. Mishkin, F. S. (1978). Consumer Sentiment and Spending on Durable Goods, Brookings Papers on Economic Activity, 1, 217-3. Mueller, E. 1963. „Ten Years of Consumer Attitude surveys: Their Forecasting Record”, Journal of American Statistical Association 58:10, pp. 899-917. Shapiro, H. T. (1972). The Index of Consumer Sentiment and Economic Forecasting: a Reappraisal in Human Behavior in Economic Affairs: Essays in Honour of George Katona. B. Strümpel, J. N. Morgan and E. Zahn, eds. New York, Elsevier, 373-396. Sims, C. A. (1980). Macroeconomics and reality, Econometrica, 48, 1–48. Throop, A. (1992). Consumer Sentiment: Its Causes and Effects, Economic Review 1, Federal Re-serve Bank of San Francisco, 35-59. Topuz, Y. V. (2011). Tüketici Güveni ve Hisse Senedi Fiyatları Arasındaki Nedensellik İlişkisi: Türkiye Örneği, Ekonomik ve Sosyal Araştırmalar Dergisi, 7(1), 53-65.